If you have children, you’ll want to explore our children’s music program. Through music, your child can develop her talent, learn about God, and develop faith. Sunday School for kindergarten through 4th grade begins with music each week during Story and Praise time at 10:20 am in room 307. Other programs on Wednesday nights offer more music options for children. To sign your child up for any of these music activities, contact the directors listed below or call the church office at 319-363-2058. Wednesday evenings offer many musical activities for children from 6:00 to 7:00 pm, including dancing, singing, and playing bells and chimes. As part of TGIW, children in kindergarten to 4th grade have 15 minutes of music at the beginning of their activity time. This helps all of them express their faith through song and movement, even if they’re not in a formal choir. This activity begins at 6:00 pm. Star Choir provides pre-school children the opportunity to experience God’s gifts through song and other activities. 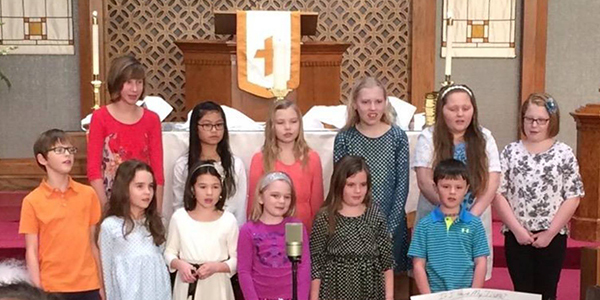 Children in 2nd through 6th grade learn to praise God through singing in the Wesley Choir. Summer Vacation Bible School offers additional musical experiences for children of all ages.